This will be the first of several posts recapping our recent vacation, a caribbean cruise on Royal Caribbean Cruise Line's Liberty of the Seas. At some point I will do a post specifically about cruising with a little one and the differences between this cruise and our Disney Cruise Line experience a couple months back. Perry's vacation wardrobe had a strong nautical theme. This Delta Gamma momma is a sucker for anything with an anchor so he has quite a bit of it. I loved this little comfortable cotton romper that says "Mommy's 1st Mate" it was the perfect travel outfit when you are cruise ship bound. We left Huntsville by plane last Friday in the evening because it was DNA Day and I needed to be at work. We stopped over in Atlanta for what was supposed to be an hour and a half and it turned into more like 30 minutes thanks to an air traffic jam. So we wound up having to run between terminals and grabbing sandwiches to eat on the next flight, but we made it. The iPad was well charged and stocked with apps and episodes of Mickey Mouse Clubhouse for toddler entertainment. And apparently Delta has changed their policy about devices lately and you can now keep phones and iPads out the whole time (even during take off and landing) if they are in airplane mode. Hooray! Perry did pretty well on the flights (he did even better a week later on the way home). 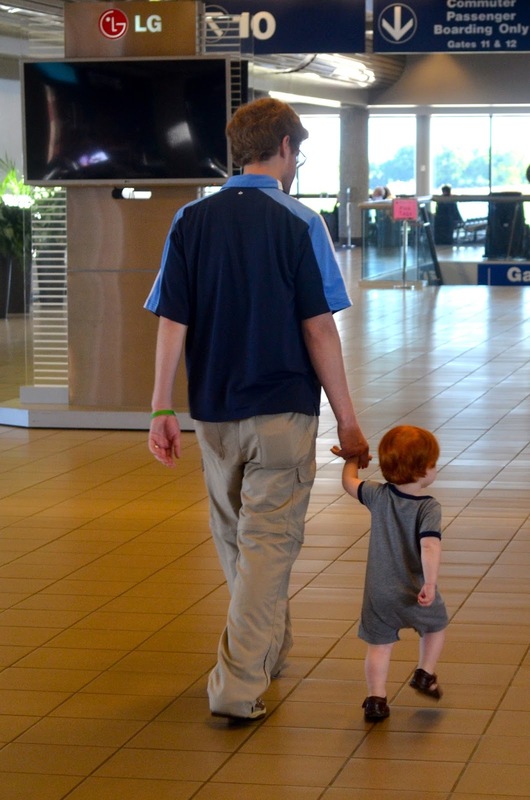 He slept through the whole flight from Atlanta to Ft Lauderdale after picking at some bread, cheese and fruit because it was bedtime and he had a little extra encouragement from a dose of Benadryl. We got to Ft Lauderdale about 10 something at night and by the time we got our bags and took the shuttle to the hotel it was close to midnight. Finding the right hotel shuttle was tough (who knew there were three different holiday inn expresses) and the shuttle felt like a sauna inside, but the actual hotel and staff were awesome. They even gave us some milk from the kitchen so P could have a midnight snack. The next morning P was up early, so we grabbed some breakfast at the hotel, got baths and were on the early shuttle to port at 10 am. We always try to get to the cruise terminal just as soon as we can so we can be the first ones on board. We were able to get our SeaPass cards and get through security easily and met up with Andrew's parents in line. They are one loyalty level with RCCL ahead of us so we got the perks of following them into the Platinum lines and waiting areas. We waited patiently and Perry ran laps around the room, ate some goldfish and made some new friends out of the strangers around us. We couldn't get on the boat until about 12, but when they opened up we were literally some of the first people on board. It was fun to wander an empty ship and get a great lunch table by the window. After lunch we went and checked out our rooms. When I was picking rooms I did a lot of online research and found these oversized corner rooms that were no more in price than a regular balcony. We went as high up in decks as we could and got room 1700 on deck 10. It was perfect. We had so much room to spread out and let Perry play. And having lounge chairs on the balcony was amazing. We spent many nights and nap times reading or napping ourselves out there. 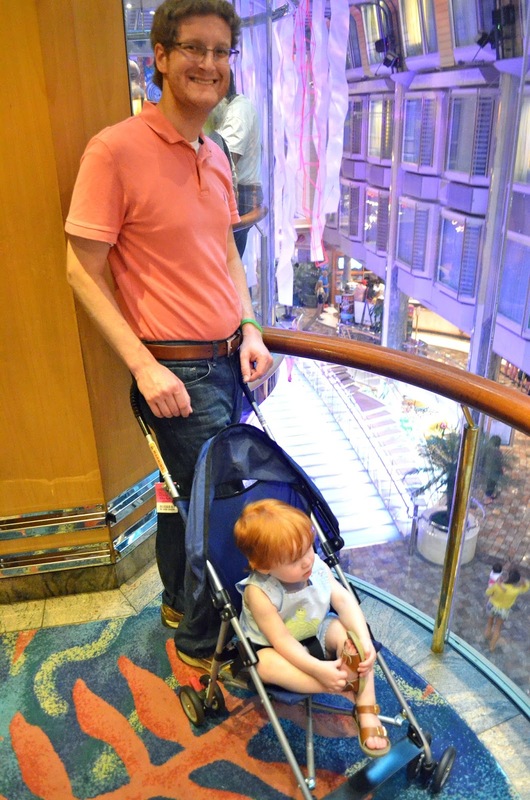 On the last cruise with a pack and play it pretty much took up the whole walkway in the room. Not so here. We even wound up leaving some suitcases out and not totally unpacked because we had the room. That first afternoon we let Perry take a nap while we enjoyed the balcony. 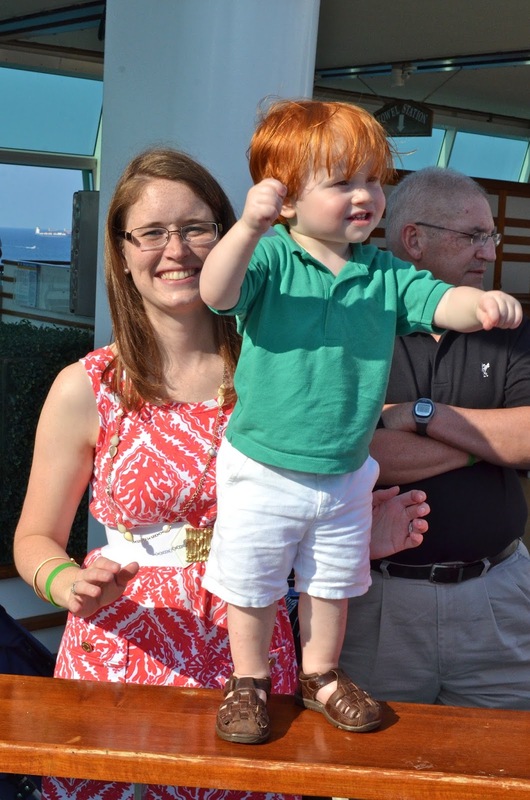 Then we went up on deck for the Sail Away party. Perry enjoyed the music and Dreamworks characters, although it was not a spectacular stage show. This is when we learned that Perry has learned some dance moves. Not sure where he has picked it up, but watching him wave his arms and shake his hips is fantastically entertaining. I am happy to report that P didn't get any sunburns all week. We kept him pretty well lathered up in sunscreen. After we had our fill of music and sun and the boat was sailing off into the sunset, we went and got ready for dinner. We had a table for just the five of us at dinners, but got to know folks at the tables around us as well. Perry did good for a 15 month old at epically long dinners five nights in a row. We learned by the end that it is best to just go ahead and get all of his food out fast so he will eat some veggies and meat and not fill up on bread and milk. The servers were amazing at bringing him food to try and being super accommodating to our food requests for him. They even entertained him by making hats and animals out of linen napkins and getting high-fives as they walked by. Perry especially bonded with the bread man. The first night he looked over and saw the man holding a tray full of bread and immediately started reaching for it. It was hilarious. The bread man always made sure Perry had enough bread to eat. Perry's first love is milk though...and we try to hide it until he has finished a satisfactory amount of food. Because once he gets his milk he is pretty much done. Only on a cruise do you eat so much dessert. And take pictures of so much food. The first nights dessert included a banana split for Perry, banana creme brûlée for me and a dessert sampler (for when you just can't choose just one) for Ann. After dinner we wandered the Promenade a little bit and hit the sack early. While we were wandering around we ran into Alex the Lion from DreamWorks Madagascar. Perry also enjoyed the multiple dog statues around the boat...boy loves dogs. So of course his beloved stuffed brown puppy had to come along for the adventure. When we got back to the room the beds had been turned down and even Perry's blankets and animals in his pack and play were neatly made. I have read on the discussion boards to try to book a cabin on the same deck as all the expensive suites because that is where they put the best room stewards...I don't think I have never had a bad one on any cruise...but ours this time (Alvin) was really great and friendly. We always worry that Perry will wake up with us moving around after he is asleep when he is in the same room as us, but he didn't. Seasickness also does not appear to bother him one bit. None of us really have issues with it thankfully. Only the last couple of days did we really feel any boat movement and then mostly at night while the boat was moving quickly and we were laying still. I don't think Perry really even knew he was not on solid ground.